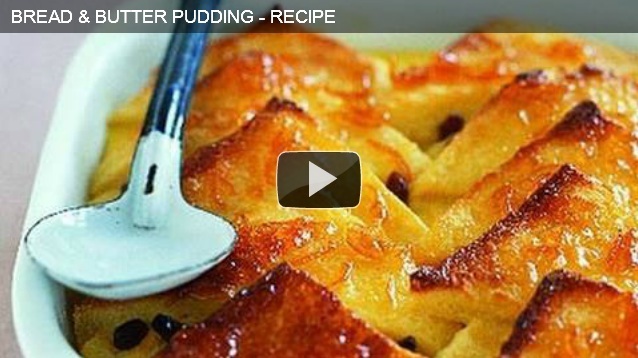 Warm and simple bread pudding recipe brings back childhood memories for most of us. It is not only a simple dessert to make but also a very delicious one. You can prepare it in no time and leave it to cook while you serve and eat your dinner, and by the time you finish it will be ready to serve and eat. Given below is a bread and butter pudding recipe easy and simple to make. Cut the bread in triangles and lightly toast it to prevent it from getting completely soggy and to preserve the crunch. In a saucepan, heat the milk and vanilla essence. Add the lemon zest and let it cool. Add the sugar and beat some more. Add the cooled milk to the egg and sugar mix. Pour in the cream and beat the mix well. Butter the toasted bread on both sides and line half of the triangles at the bottom of a glass serving dish. Pour half of the egg and cream mix on the bread slices and sprinkle half of the raisins and currants on the top. Let the bread soak for about 20 minutes. Arrange the remaining bread slices on the top and pour the remaining mix over them. Sprinkle the remaining raisins and currants. Drizzle the remaining butter and sprinkle the demerara over the top. Lastly, grate some nutmeg on the top. Bake in the preheated oven for about 35-40 minutes until the tops are golden brown. Remove and cool for about 10 minutes before serving. You can remove the crusts of the bread before cutting if you don’t like the crusts. White and dark chocolate can also be added over the layers of bread to add a different taste to the pudding. Sprinkle some icing sugar on the top for a slight crunch. Whipped cream and fresh fruits can also be served along the side of the pudding. Heat some of your favorite jam or marmalade in the microwave for 40 seconds and use a pastry brush to spread it on the top of the pudding. Bake for another 2-3 minutes before serving.